In a bow to the ever-increasing move to outboard power in cruising boats, Jeanneau is introducing its new Leader 33 Outboard, with twin 250-hp Yamahas, at the Miami boat show starting Feb. 14. It is designed to be a faster, quieter and easier-to-service version of the previous Leader 33, which had inboard engines. It also can cruise into thinner waters or serve as a picnic boat on a beach; just tilt up the outboards. 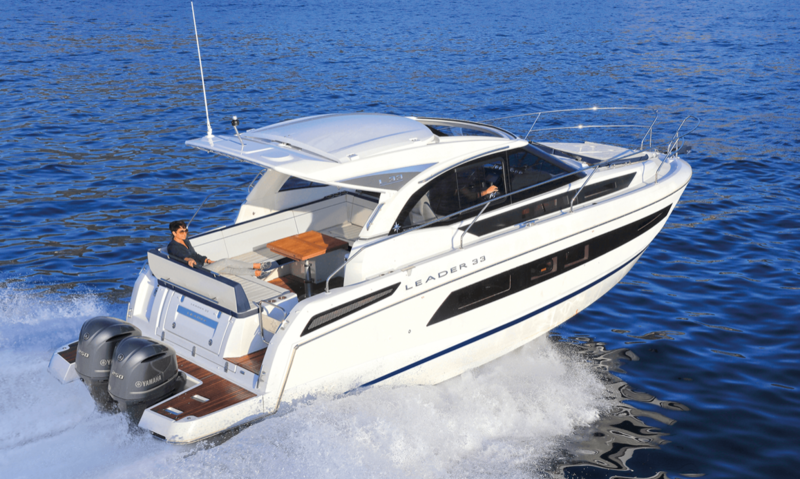 The new Leader 33 Outboard is a twin-cabin, one-head cruiser, with an open, light-filled salon and a cockpit that simply invites entertaining and lounging in the sun. Most of the cockpit is protected by an overhang from the cabintop, and it features a large U-shaped settee on the port side that flows into the cabin, which is open aft. The back of the settee folds down and the entire area can become one large sunpad when the weather is right. The sleek, flowing windows in the salon let in a lot of natural light. So does the electrically controlled sunroof overhead. The accommodations deck is three steps down, with the galley to port and the head, with a separate shower, is to starboard. The forward part of this compartment is innovative, or at least dual-purpose. In its dining/social configuration there is cushioned seating forward with a table. 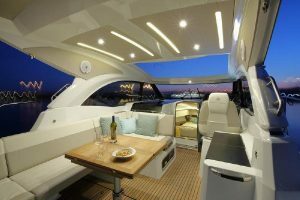 At night, you can remove the table, change the cushions, extend the bottom part of the bed, and the area becomes a private master stateroom with a pocket door to provide privacy. The second, guest cabin is aft, tucked under the salon. It has two berths. We don’t have any speed or performance numbers on this new Leader outboard, but they should be available after the Miami show. Specs. : LOA: 34’7”; Beam: 10’10”; Draft: 3’1: Disp. : 10,829 lbs. ; Fuel: 138 gals. ; Water: 46 gals. ; Power: 2×250-hp outboards.